Chocolate and peanut butter get swirled into warm milk and cream to create a sweet treat. As you read this post, I’ll be on a plane flying to Charleston, South Carolina. Squirrel and I are taking a week long foodie vacation. I booked this trip in the spring as a graduation present to myself. An entire week of food…now that’s my kind of vacation! I wanted to leave you with something sweet and warm to keep you cozy while I’m away. I combined two of my favorite snacks to create a very decadent sip-able treat. 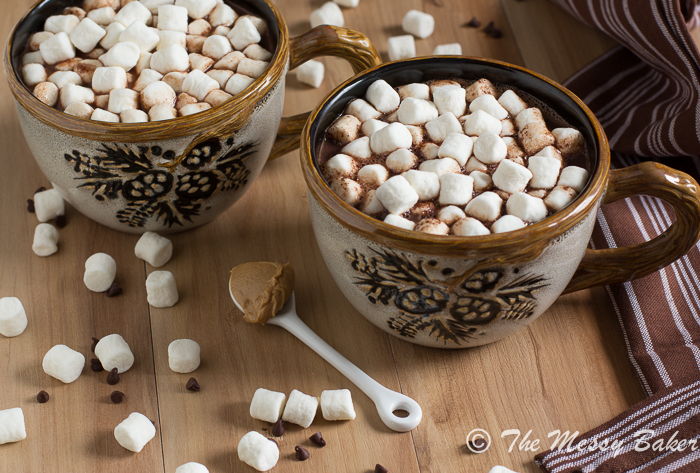 How does milk chocolate peanut butter hot chocolate sound? This warm treat tastes just like a melted Reese’s cup. Basically, it’s a peanut butter cup in drinkable form. Say what! 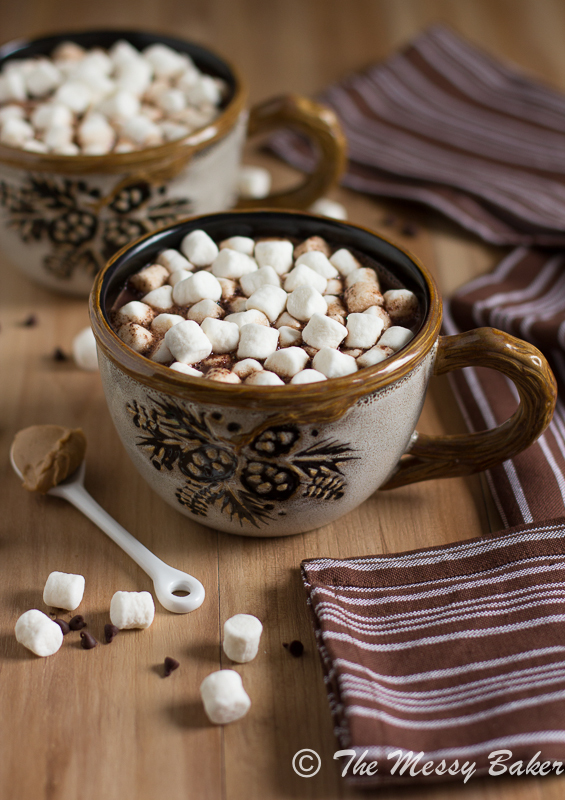 This recipe makes enough hot chocolate to fill a large mug. Top with mini marshmallows to make it extra special. Extra mallows for me, please! After one sip of this warm treat, and you’ll never go back to the powdered version. I don’t get adding water to powdered chocolate. Yeah, there’s powdered milk in the packets, but it’s just not as good as the real thing. Am I right? I want thick, creamy moo juice! Simmer milk and cream until hot to the touch and steaming. Add in your chocolate and stir until smooth and melted. Stir in peanut butter until just melted. Pour the mixture into a big ol’ mug. Top with mini mallows and enjoy. You’ll be sipping on sweet chocolate peanut butter perfection in no time. While you’re sipping on this sweet beverage, I’ll be doing a food crawl in Charleston. Don’t worry, I’m not going to leave you hanging while I’m gone. I have Kayle of The Cooking Actress stopping by on Tuesday to provide you lovelies with a delicious treat, and I scheduled a healthy treat for you on Thursday. When I get back, I promise to overwhelm you with photos from our trip. If you just can’t make it until I get back, feel free to stalk my trip on instagram. It’ll be like you’re traveling with me. Now, I have to go stalk Pinterest so I can get my outfits together for Charleston. See you next week! Rich, creamy hot chocolate with a spoonful of peanut butter swirled in. Bring milk and cream to a simmer in a small saucepan over medium-low heat (do not boil). When the milk begins to steam, add the chocolate. Stir until the chocolate melts. Add the peanut butter and stir until just melted. Pour into a large mug. Top with mini marshmallows. Have a most wonderful, wonderful trip!! Have an amazing vacation! Can’t wait to read about it! This looks so yummy! I bet a few pub chips on top would be great too. I hope you enjoy every delicious morsel of your food crawl, Jen! You deserve a week of doing whatever it is you want (I LOVE that all you wanted to do was eat. This is why we’re friends). 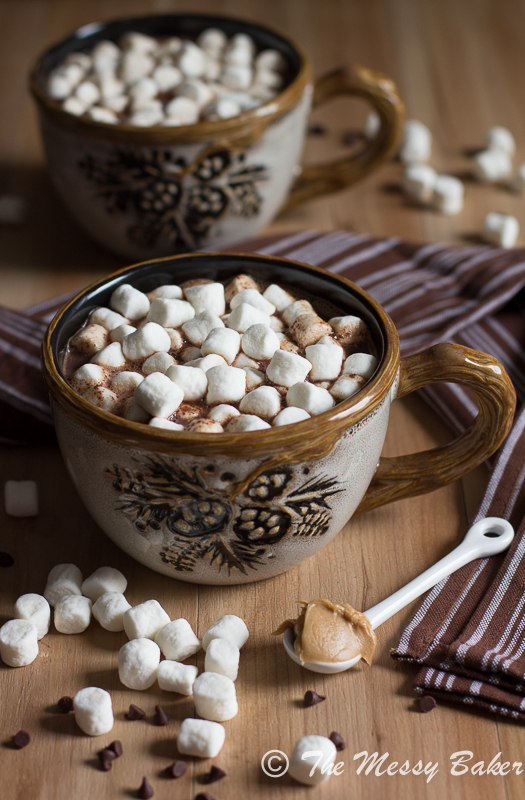 This is the only way to make hot chocolate – none of that powdered mix for me. Peanut butter cup in drinkable form = heaven! 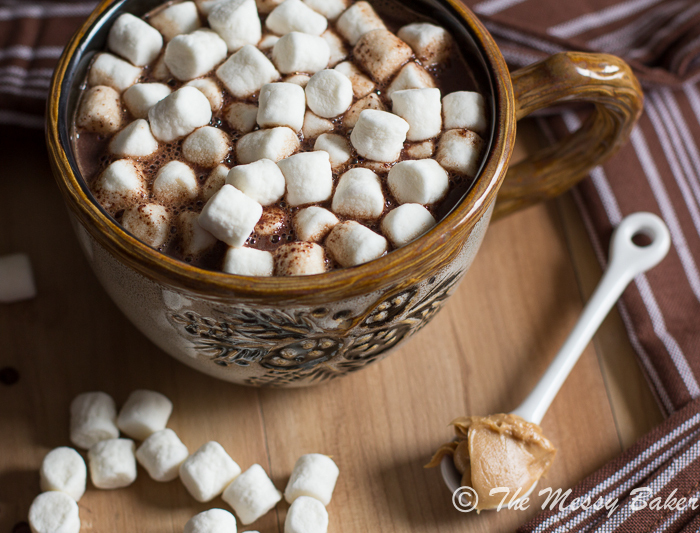 It’s a chilly day and I could really use a cup of this hot chocolate! Pinned! Enjoy your food-cation! I love adding in other flavors to hot chocolate, makes it feel more adult to me! This looks amazing! Who wouldn’t like a Reese’s pb cup in drinkable form. Pinned and definitely making. Have safe travels! Yayyyy!! Have an amazing vacation!!!!! AND OMG THIS HOT CHOCOLATE! STOP IT! no don’t stop just pour it down my gullet!! 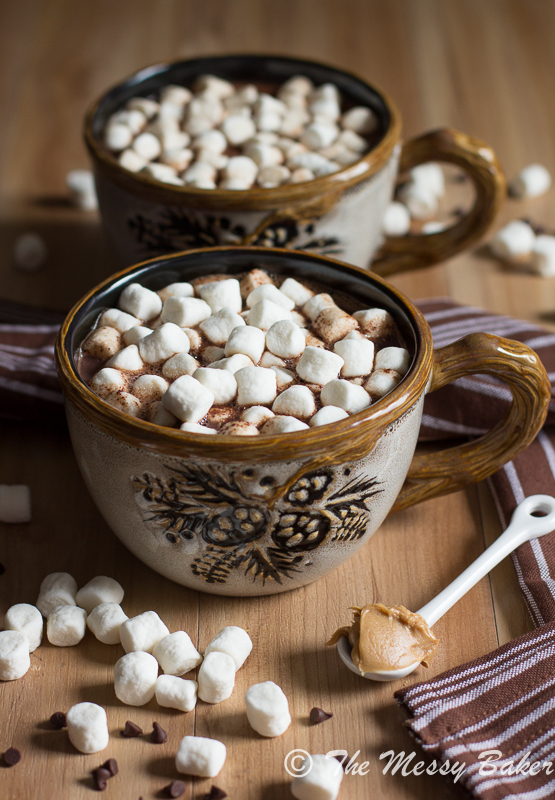 Wow — hot chocolate that tastes like a Reese’s cup? How could that NOT be wonderful?! I can’t wait to try this. Hope you have a wonderful trip! HOW have I never thought to put peanut butter in hot chocolate??? I looooooove it!! This is how I want all of my hot chocolates ever! 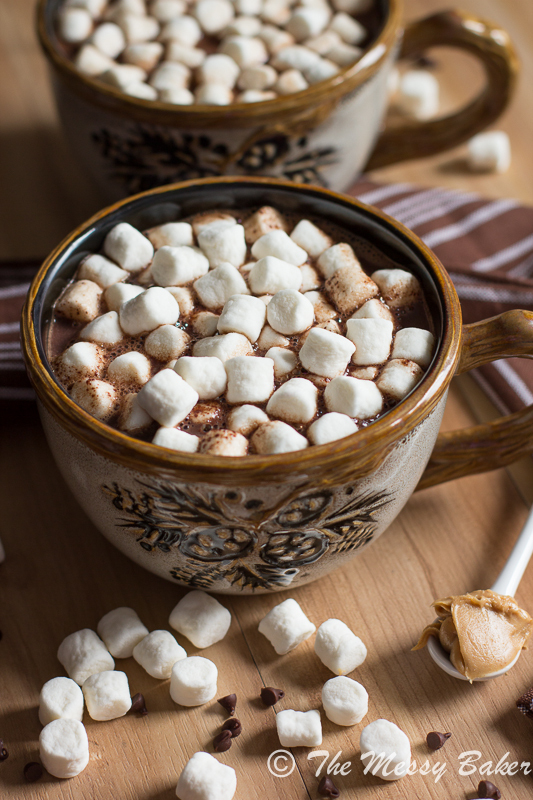 Shut up with this hot chocolate. Peanut butter. Jennie, I love you. This looks amazing, Jennie! And the photos are gorgeous! A drinkable reese’s pb cup?! Sounds like a dream come true. I’ll take that spoon of peanut butter too! Have a fabulous vacation! Thanks for this delicious hot chocolate! This looks absolutely scrumptious. My sister and I are gushing over your adorable MUGS! Can you please clue us in to where we might find something similar? Sounds delicious tastes not all that awesome. I love the added cream and using actual chocolate chips. The end result was not enough of a peanut butter flavor and the pb didn’t fully melt into the drink, it was too clumpy for my taste. Incredible idea gone bad. Hi Elacie, I’m so sorry to hear that you didn’t like the recipe. I’ve made this several times and have never had a problem with the peanut butter staying lumpy. Did you happen to use all-natural pb? All-natural pb has a tendency not to melt fully. You can try increasing the pb to 1 and 1/2 tablespoons for an extra boost of pb flavor, but I wouldn’t increase it anymore than that or else the mixture becomes too thick. Thanks for your feedback! hi! whats the mug’s brand? Just have to say, what be-YOO-tiful mugs!! !